Give someone you care about the sensation of snacking in a Tuscan villa with a tasteful gift that's sure to please. 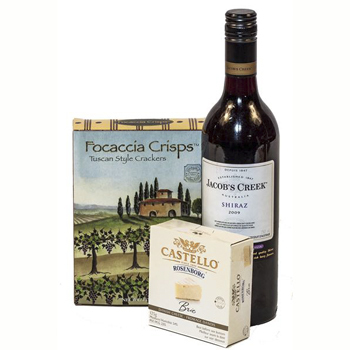 A bottle of fine Dry Red Wine is perfectly paired with Castello Cheese and Foccocia Crisps to create an ideal evening snack or appetizer. Celebrate a birthday, say Thank You, or boost the romantic mood when you send A Taste of Tuscany in the Afternoon. Attention: Either crisps or crackers will be delivered with this basket depending on local availability. Please note that this item is available for delivery in Ontario only.